JSTARS Mission Crew Commander Lt Col Barbara “Rowdy” Omstead, Spaatz #743, and her crew, 128th Expeditionary Airborne Command and Control Squadron Crew 3, earned distinction as the Air Battle Management Aircrew of the Year for exceptional performance under combat conditions while deployed to Operation IRAQI FREEDOM. 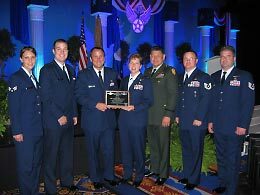 This service-level (USAF and Army) award was presented at the Air Force Association Annual Conference on 12 Sep 05. Lt Col Omstead is center, holding the award plaque with Aircraft Commander Maj Jeffrey Jenkins. Seven members of the 26-person crew were on hand for the award presentation.